When reviewing Mega Turrican, the obvious comparisons to be made are between this game and both the original Turrican and Contra: Hard Corps. Mega Turrican is what the first Turrican should have been. 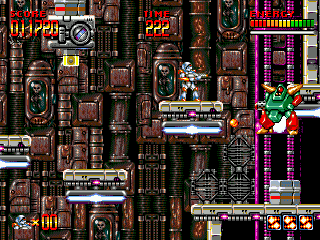 The game is actually the third in the series, as Turrican II was only released on select home computer systems. The game starts off with a much-improved remix of the original title music played during an opening sequence that presents the story line. The excellent music is in fact one of the game’s great strengths, especially considering that the first Turrican was completely devoid of any BGM whatsoever. The visuals are also a huge improvement in this game. The later levels of the game have some of the most detailed graphics on the Genesis, and in my opinion could almost pass for a Saturn game. The most important improvement of all, however, is the game play itself. Like the first game, Mega Turrican has an excellent variety of environments, and the game never feels like it’s getting stale or repetitive. Frequent mini-boss and boss battles keep you on your toes, as well. This game is still very hard, but the things that made the original game too difficult to be enjoyed have all been fixed. Furthermore, the difficulty level ramps up gradually, making the game more approachable than Contra. That’s not to say that the game doesn’t still have it’s share of cheap and/or frustrating deaths, but you do your best to learn from your mistakes and avoid them in the future. Each level contains several extra lives that are either hidden or challenging to get to, but these help ease the difficulty level later in the game. Mega Turrican is easily one of the best action games on the Genesis, and I’d take it over the more critically-acclaimed Contra: Hard Corps any day of the week. Tagged Action, genesis, Mega Turrican, Review, sega. Bookmark the permalink.